Please open the PDF file below; print this FREE pattern and share with your friends. When designing this Shoulder Bag I was thinking of the summer ahead, upcoming travels and family gatherings. In addition, I wanted to use up some short ends of dyed reed that had accumulated from classes and other projects. This basket's size is 3" x 13" x 13" tall and each row of weaving is about 3 feet in length. In the pattern I'm giving you the 'Recipe' I used, but I encourage you to think of your particular needs, get out your leftovers, add a pound of 5/8" Flat for stakes and some weavers, gather your rim materials and choose the style handle that appeals to you! 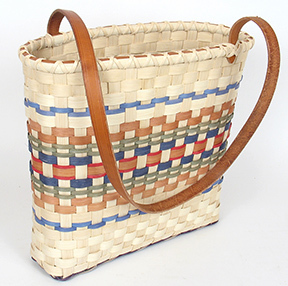 Calculate Supplies for 1 to 20 Summer Shoulder Bag baskets with the Basket Supply Calculator. The Supply List gives you the least expensive way to purchase the supplies for your quantity of baskets. View on-line or print to your printer.